Carousel Designs Navy and Orange Woodland Animals Crib Skirt Box Pleat 14-Inch Length by Carousel Designs at Animal Backgrounds. MPN: CD1BBW-C-SK-14-PL. Hurry! Limited time offer. Offer valid only while supplies last. 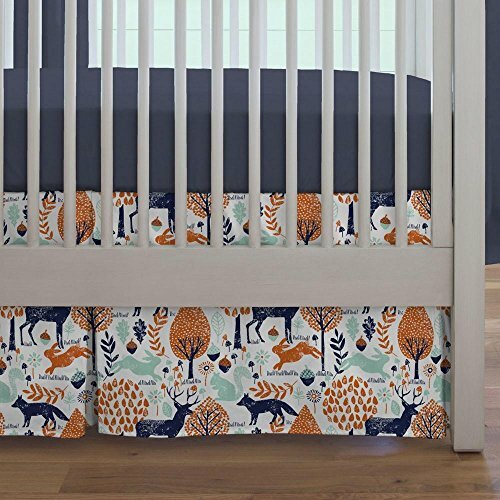 Navy and Orange Woodland Animals crib skirt. Think outside the box and get creative! Get your crib picture perfect with our box-pleat crib skirt. Navy and Orange Woodland Animals crib skirt. Think outside the box and get creative! Get your crib picture perfect with our box-pleat crib skirt. Finished length approximately 13-14 inches. Fits standard cribs using mattresses measuring approximately 28" x 52". Dry clean only. Fits standard cribs using mattresses 28" x 52"